We all have our morning routines which will vary from person to person. I like to get up early before the sun rises when things are quiet (and kids are asleep!!). There is something so special about this time of the day which you can’t get once the day starts. Over the years my routine has been pretty much the same, starting with Nitnem banis, followed by some Kundalini Yoga and stretches to tune up my body; I then end with some meditation. Normally this takes me about 2+ hours, but sometimes I shorten things depending on how much time I have (like if I wake up late one morning or am sick). I love the ending part (meditation) when I sit down, close my eyes and go inside. This is when I use the Gurmantra: "waheguru" and sing/chant along with an audio recording. Of course you can chant waheguru without an audio, but I have found that an audio can be a nice tool, helping me in my meditation (or it can be a distraction as well if it is the wrong audio!). The problem I have found is that many of the audio recordings are not ideal for meditation. Some are too fast, "sing-songy", short, distracting, varied and just not consistent. When I sit down to meditate I want to go inside and focus on chanting waheguru. It’s not so much about the singing, but about about the repetition and the "churning" of the naam which cuts through the garbage in your subconscious and "cleans the shop" (your mind). 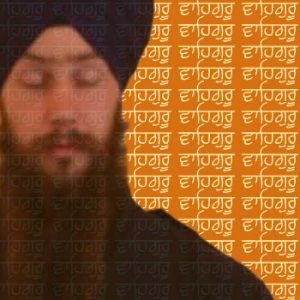 Over the weekend I had the idea of creating a "pick list" of "waheguru" audio which would be good to use for meditation. It seemed simple, but proved to be quite time consuming! I scoured through SikhNet’s thousands of MP3 files in search of audio which had the repetition of "Vaheguru". I then had to listen to each of the files I found and determine if they matched the criteria I was looking for. Musical composition was not too difficult or varied so that it was easy to sing along with. Musical tune that was steady and simple so that it was not distracting. Vaheguru Mantra fully pronounced correctly in three syllables ( Vah-Hey-Guru) & not rushed. Continuous recitation. No long breaks in between the recitation. Not distracting from the focus of chanting Vaheguru. Listening & chanting along created a meditative feeling. Out of my first pass I had a folder of about 95 audio tracks which was still too many. I then spent most of Sunday taking them all for a "Meditative Test Drive". It’s one thing listening to an audio or Gurbani, and another thing actually sitting and meditating to it consciously. I sat and meditated with each audio to narrow down the selection to tracks which were more ideal for meditation. The only way to really tell for sure was to try each one of them out. By the end of the day I felt so peaceful and unshakable. I was going to rank the tracks in order of my favorites but that proved to be too difficult. It’s also hard to rank one against another, especially since people’s preference vary from person to person. Some audio tracks might be ideal for female voices with a certain pitch and vice-versa. Some might like a particular musical style better than others. I have split my audio picks into two different categories: (1) Simple / Monotone & (2) Sing along. You can listen to all the audio online and download some of them from the Gurbani Media Center, however some are commercial tracks by musicians so if you like them you would need to order a CD or MP3 purchase. Remember, the point of this post is not to share more audio to LISTEN to. The point is that you actually use it to MEDITATE with. So whether you do so in your chair at your desk or at home, please close your eyes, go inside and focus consciously on the waheguru mantra as you chant it. If you do not already do so hopefully you make this a part of your daily routine. Make a commitment for some period of time like 40 days and see what happens? You can create a custom play-list on the SikhNet Gurbani Media Center of just the below audio that you like. Assuming you are already registered and logged into SikhNet all you need to do is click the icon image on a particular track that you like and then click on the "Add to playlist" option. Or you can listen to all of the below audio’s on my playlist. The audio in this group has either monotone tune or very simple tune which doesn’t require a lot of vocal skill. The focus of these audio tracks is chanting and simple recitation of "Waheguru". In this audio you can really get into a kind of "waheguru trance" as you repeat waheguru over and over in the rhythm. It is a bit faster then some of the other audios featured here. You might have to take a small breath at the end of each vaheguru since it keeps going without a break for a breath. This monotone style audio easy to chant with and has nice background audio. There are four repetitions and then a break to take a breath. Chant along with the sangat as you sing with this live audio recording of Sikh youth chanting together. Beautiful background music of sitar, dilruba, vaja & tabla. This classical style audio is easy so chant along with and has a traditional Indian sound mixed with some western style. Nice male vocals with beautiful background music with consistent chanting. The tune might be low or high for some; Which might make it harder to sing with depending on your normal voice, and if you are a man/women. This is an looped edited version of the original audio to have continuous repetition of the mantra. Nice female vocals with beautiful background music with consistent chanting. The tune might be low or high for some; Which might make it harder to sing with depending on your normal voice, and if you are a man/women. This is an looped edited version of the original audio to have continuous repetition of the mantra. This is an older style audio which sounds like a looped recording of the "satnam waheguru" portion. This audio is a call and answer style where you first hear Snatam Kaur and then you repeat after. As you hear her sing mentally chant Vaheguru in your mind and then repeat out loud. It starts off smoothly and builds energy as it progresses. Beautiful vocals along with really nice background music (flute, harmonium, harp & many other instruments). As you chant vaheguru the speed changes from single to double and back again. The chanting speed is fairly fast so you have to take a quick breath in between. This is an audio excerpt from a Gurdwara lecture in Singapore where the whole sangat is chanting "Vaheguru" together. There is no music other than the sound of the Sangat chanting together. The audio focuses pronunciation and chanting the mantra in three parts. Wah-Hey-Guru. There are no musical distractions in this audio; only the focus on chanting "Vaheguru". The audio in this group is more varied and is more of a singing style rather then "chanting". The pace of this audio is very steady & slow, allowing you to really get into the chanting of the Vaheguru mantra. The subtle sounds of the sitar, guitar and tabla add a nice atmosphere. The vocals make you want to just sing from the heart and just pull you into it. This is a beautiful live recording from the Summer Solstice Camp in Espanola, New Mexico at the end of a Gurdwara which was looped to go to 11 minutes. This audio is classical Indian style with male vocals. It is sung in a call and answer style where you first hear him sing twice and then you repeat after. As you hear him sing mentally chant Vaheguru in your mind and then repeat out loud. The speed changes as you go through the audio. When you sing this audio you feel it coming straight from your heart. Full of love for the infinite God. This is an audio that you just want to sing out loud with love. The beautiful voices along with guitar in this nicely paced audio are great to sing with. Another beautiful audio with guitar and vocals that come from the heart. You go on the journey singing along with her & the sangat as you feel closer to God. Very up beat and energetic, this classical style audio is one that you sing to. It is well paced for easy chanting along. No falling asleep in this audio. Meditate with the kids! In this audio you chant along with children from the Guru Nanak Sikh V.A. School (UK). This audio is very relaxing and easy to chant with. This is one that you and probably even the kids can enjoy. My kids love hearing other children. This audio is classical Indian style with female vocals. Sing along with this sweet traditional style version of Vaheguru. This south american version of the waheguru chant is a nice musical version to sing with and just relax. This is a nice simple audio track singing Vaheguru in a basic tune with male vocals. Little distractions and easy to sing along with. Do you have an audio that is not on this list that you think I should include? Please let me know, send me a link or the file, or just post it in the Gurbani Media Center and send me a link. Thank you so much for this hardwork. This will prove to be a great tool to practice. Wow! this is fantastic. Thanks so very much. thanks, Gurumustuk Singhji,…if you don't mind can you plz tell us what time do you start your nitname and what time you finish.. do you feel sleepy during the day..
What a great compilation! Thanks! The 11:20 track listed as “Unknown” is a loop from Jagjit Singh singing Ram Simar Ram Simar. There's a track by Snatam Kaur which is only about 3 minutes long, in the same tune as the one you've posted but much slower. It's very good for amritvela and has an atmosphere which makes you think you're sitting in pure nature meditating. It would be good to add to your list. Thank you! The one with Sat Kartar Kaur is wonderful, but the list in it self is also very educational. So many different styles. Thank you so much for sharing all this wonderful information.there is one more worth listening is SIMRAN SADHNA by Bhai Jasbir singh Ji Khalsa. Awesome compilation…..Sat Kartar Kaur’s Simran takes you to another level…..
Great Compilation! Thanks for all the hardwork. Thanks a lot for this audios. I was looking for the Bhai Rai Singh recording… It inspires me in my meditation. Love and blessings from Spain. From where can I purchase the Bhai Niranjan Singh gurumantar enlightens, the instrumental waheguru cd?